Sales and Marketing Professionals use business mapping software to help achieve quarterly sales goals, define sales territories, and identify new markets. Cloud-based and affordable business mapping connect sales goals results to target areas displayed on an accurate map. The geographic visualization of sales and marketing activities provide unique business perspectives that help develop winning strategies, powering sales growth and suggesting new market strategies. By sharing map views across sales and marketing teams, sales intelligence is communicated and improved strategies for success are born. Business mapping software is a simplified and more affordable alternative to a full-on Geographic Information System (GIS). A true GIS is a big investment and a valuable asset for any organization. But often, only large companies that are dependent upon geographic science (think energy and land management orgs) are going to utilize GIS. Access to maps for low-level sales and marketing folks within GIS heavy organizations can be spotty. “Get in line,” is the response non-core GIS map requests are often met with. That’s why a small investment in cloud-based business mapping software makes so much sense for companies that could benefit from some basic map love. Basic business mapping is affordable and easy-to-use. Give your people what they need. Expand your sales and marketing teams’ location awareness. Be sure your sales and marketing folks have easy access to customer address databases and prospective customer lists. These very basic spreadsheets are the cornerstone of advanced sales and marketing analysis for your business. Business mapping software converts simple customer address lists into geographic visualizations that provide fast and effective snapshots of your company’s sales coverage(s). Historical sales records by address reveal the company’s recent regional sales patterns. Product sales activities are identified and correlated with lucrative ZIP code areas, exposing actual customer purchasing patterns that point to customer demographic characteristics by ZIP code. Customer visualizations also suggest industry categories that define broader marketing targets for products and services. While physical business locations, exposed along a sales route, become never before targeted prospects for sales and marketing contact. Map visualizations of your internal address datasets lead to new markets and new customers. Business mapping software is a double-check on the distribution of sales activity. Are goals, tasks, and account responsibilities evenly meted out? Or are certain sales associates overwhelmed with customer calls while others can’t seem to fill their day with sales activities? 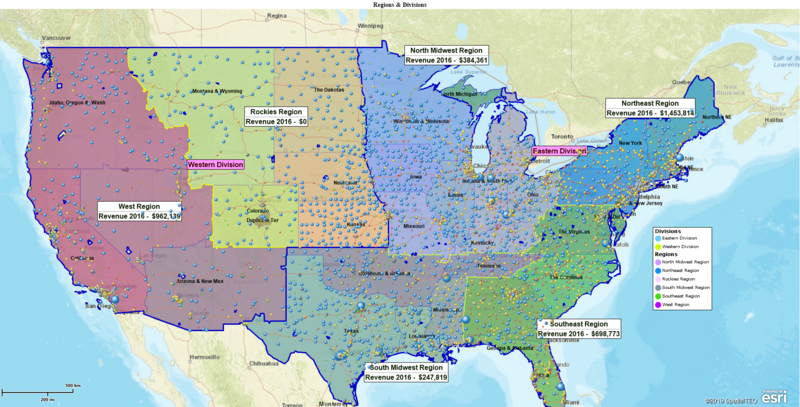 Sales territory maps define sales accountability by area and customer. Overlapping coverages can be addressed visually on a territory map. Multiple sales channels, from a total addressable market, are merged into full territory analysis. A defined sales territory becomes the repository for current customers, new lead sources, existing account responsibilities, and even product applications. Sales territory maps visualize imbalances and should be shared across the sales team to help effect new approaches. Sales territories naturally incorporate company goals and provide the perfect platform for shared group visualizations. Learn more about Sales Territory Mapping. A well-balanced sales team is more effective at recognizing new opportunities and driving new sales efforts. An effectively balanced sales team will expose new customers and turn those new customers into new markets. All of this sales intelligence is critical data for your marketing team. Encourage customer storytelling. A marketing manager uses business maps to clearly establish what markets are working and why. Marketing maps visualize existing customers, recently exposed customers, and prospective customers. Marketing maps setup location-based data analysis that exposes patterns in customer behavior. Imported current customer locations and prospective customer locations help define what works now. Overlay these views with a layer of ZIP codes color shaded by demographic characteristics and let marketing maps tell the story of what’s working and why, pointing to new market opportunities based on demographic profiles. Marketing maps define the addressable market based on past success while suggesting new areas to exploit and new approaches to test. These new opportunity maps help define where the premium opportunities exist for new products or where the most lucrative locations for new retail outlets might be. Call center sales, retail sales, direct mail sales – they all benefit from location sales intelligence. Prospective business leads, selected by industry categories with a record of interest in the products offered, overlaid on top of a marketing map, suggest key campaign segments for an overall marketing plan. Marketing campaigns will test leads selected by name, industry, geography, business size, or location configuration. Test results are fed to sales representatives and transformed into sales campaigns. Sales result maps by territory are shared in sales and marketing meetings. Sales and marketing people share stories of customer reactions, sales successes, and product applications. Lessons learned are lessons shared. The whole company benefits from shared experiences as sales plans are adjusted and sales tactics are fine-tuned. Figure out the best time to encourage sharing at your business. Buy the doughnuts, or responsibly serve the beer. Just make the folks, who all work for you, sit down and view business maps and share stories of selling and sales results. Business maps visualize success and encourage discussion. No maps and no results sharing leads to slow growth or worse. Encourage map use and sharing. Learn more about map sharing. This entry was posted in Business Mapping Software blog post and tagged Business listing, business mapping, sales territory map. Bookmark the permalink.